With the Dow Jones Industrials up 27% in 2013, people feel wealthier. Unfortunately, most of this new wealth has found its way into the pockets of those who were already wealthy to begin with. The bull market in gold will return in 2014. Meanwhile, income investors got hammered last year. Because of rising interest rates, bond investors during the year lost anywhere from -10% to -20%. And the worst part about it is that it will take many years for these conservative investors to break even since rates remain nominally low. As usual, our mainstream media is completely missing the point and ignoring gold. No one bothers to point out that it’s highly likely to continue its ascent in 2014 after a deep two-year correction. When the Federal Reserve announced on December 18th that it will taper its bond buying program by $10 billion per month, the demand for gold should have tapered off too. After all, the inflationary pressure of printing $85 billion per month would be removed from our economy by September of 2014, which would mean that gold prices should go down. Physical demand for gold has never been higher. And gold prices stayed around $1,200 and it’s now creeping higher. Clearly, the markets don’t believe the Fed will actually stop printing money. Or it’s possible that the gold market senses that the dollar is debased nearly beyond repair. Equally important to a 2014 recovery in gold prices is the fact that China is taking over the world right under our nose, and they’re doing it with gold. Their plan is simple: Buy up an enormous stockpile of gold, enough to back the Chinese currency with it. Then they’ll revalue the currency by letting it float and trade freely. In 2013 China bought tons and tons of gold while the prices were down. In fact, they bought more gold last year than was produced in the entire world, a total of 3,200 tons. Total worldwide production was estimated to be at 2,900 tons last year. And not one ounce of their 440 tons of domestic production is sold to anyone but the Chinese – their government won’t allow it. Admittedly, not all 3,200 tons is going to the Chinese government. But a large percentage certainly is. According to the World Gold Council, China’s government has reported only 1,054 tons of gold in their possession. But they also report that China’s consumer demand for 2013 was around 800 tons. So let’s see… There were 3,200 tons delivered in China, but “only” 800 tons of that were going to consumers. So where’s the rest of the gold going? An educated guess is that it’s going to the Chinese government. And they’re under-reporting their gold holdings by a laughable amount, attempting to keep their role in the quickly changing world order from being detected. If China had a currency that was backed by gold, and it was traded freely throughout the world, it would replace the U.S. dollar as the world’s reserve currency. Banks and financial institutions would immediately dump a good portion of their dollars and buy the Chinese Renminbi. Renminbi would be accepted in many countries, and in many stores, both online and brick and mortar – even in the US. And of course, once this was announced, dollar denominated assets would fall – some experts think by as much as 50%. So if the dollar fell by 50%, what do you think that would do to stocks? Or how about bonds? Of course they would plummet. In short, it would be the death knell to the dollar and Americans would lose trillions of dollars. We would lose our way of life – no more cheap imports, no more easy credit. We would simply have a lower standard of living, because we’ve been borrowing against the future for too long. 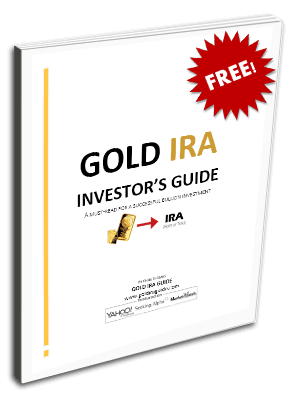 All of the pieces are in place, and the bull market in gold is ready to resume in 2014. There have been 7 major corrections in gold since 1975, where the average decline is -38.9%. The average length of time for these pullbacks is 26 months. In our current correction which started in August, 2011, we have seen a decline of 39% which has lasted 28 months. If history is a guide, then we’re near the end of this correction. Fundamentally, nothing has changed. The U.S. government along with the Federal Reserve has ruined what was once a sound currency and has confiscated our wealth through their inflationary policies. A fiat currency such as the dollar can only take so much abuse by its government before it cracks. The unfortunate outcome when this happens is erosion of freedom, war, and poverty. If you want to maintain your wealth and liberty, gold has got to be a part of the solution. What Do the Russians Know That No One Else Does?